To Cite: Akhondzadeh R, Rashidi M, Gousheh M, Olapour A, Baniahmad A. The Effect of Adding Dexmedetomidine as an Adjuvant to Lidocaine in Forearm Fracture Surgeries by Supraclavicular Block Procedure Under Ultrasound-Guided, Anesth Pain Med. 2018 ; 8(4):e74355. doi: 10.5812/aapm.74355. Methods: This was a double-blinded randomized clinical trial conducted on 72 patients with ASA classes I and II, which were candidates for forearm fracture surgery. In group A, patients received 3 mg/kg of lidocaine 2%. In group B, patients received 3 mg/kg of lidocaine 2% and DEX (1 µg/kg). The ultrasound-guided supraclavicular BPB was performed in all patients. The onset of sensory and motor blocks were evaluated with pin prick test and modified Bromage scale, respectively. The sensory and motor block moment was recorded as the onset of the block. The first analgesic request time, total consumed analgesic, adverse effect, and hemodynamic parameters of patients were recorded. A visual analog scale (VAS) was used for recording the severity of pain. Results: The two groups showed no significant difference in the demographic variables. The onset of sensory and motor block in the DEX groups was shorter. The duration of sensory and motor block, and analgesic request was significantly longer than the control groups. Total analgesic consumption 24 hours after surgery in the DEX groups was significantly lower. Moreover, hemodynamic status of patients in both groups was stable and no significant difference was observed between groups. This study showed that DEX, as an adjuvant to lidocaine, improve the characteristics of supraclavicular BPB and decrease the postoperative pain. Local anesthesia is a safe and effective method in different surgeries such as upper extremity surgeries (1). This approach has several advantages over general anesthesia including lack of pain during operation, decreased postoperative pain and analgesic dose, more hemodynamic stability, and increased patients satisfaction (2-4). Supraclavicular brachial plexus block is a common method in forearm surgeries (5). A single dose of local anesthetic has a limited extend. Therefore, different adjuvants such as opioids are added to improve the quality and length of analgesic effect, however, due to the various side effects of these drugs, such as respiratory suppression, hypoxia and apnea, efforts to find better options continue (6, 7). Dexmedetomidine is a new generation of alpha-2 adrenergic receptor agonists with high selectivity that had been approved by the US food and drug administration (FDA) by the end of 1999 for administration as a short-term sedation and analgesia agent in intensive care units (ICUs) (8, 9). Combining DEX with local anesthetic is an efficient approach to improve the effectiveness of local anesthetic and to decrease their required dosage (10). Lidocaine is the most common local anesthetic of the amino-amide family with moderate duration of action. Lidocaine is used for local anesthesia, peripheral nerve block, and epidural and spiral anesthesia (11). Improved quality of local anesthetic drug’s efficacy in local and regional blocks and control postoperative pain is the most important parameter for patients; furthermore, it is selected as the best method for early ambulation (12, 13). The objective of the present study was to investigate the effects of adding DEX to lidocaine for improving block effectiveness and decrease pain in patients undergoing ultrasound-guided forearm fracture surgery. In addition, onset of sensory and motor block, duration of sensory and motor block, the first analgesic request time, and total analgesic used during 24 hours as well as hemodynamic parameters and the side effects were evaluated. This study was a double blind, randomized, clinical trial that was conducted in the Imam Khomeini and Razi hospitals, Ahvaz, Iran during June to December 2017. All of the study protocols were performed according to the guideline of the ethics committee Jundishapur university of medical sciences, Ahvaz, Iran with reference number: IR.AJUMS.REC.1369.20, and registered as a clinical trial in the Iranian registry of clinical trial (IRCT) (IRCT2017040433210N1). Before the start of the study, researchers clearly explained the objectives and protocols of the study and possible benefits and side effects of the treatments to all participants. Then, all of the patients filled and signed a written consent form on their participation in the study. Inclusion criteria were patients between 18 and 60 years old for forearm fracture surgery with ASA class I and II. Patients with cardiovascular and liver disorders, sensitivity to study drugs, history of alfa-2 adrenergic, painkiller or opioids before surgery, and need for general anesthesia during surgery were excluded from the study. The anesthetic technique details and the instruction on the scoring on the pain intensities using visual analogue scale (VAS) were explained to the patients. As a premedication, midazolam (0.03 mg/kg) and fentanyl (3 µg/kg) were given to patients through intravenous injection. The patients were randomly assigned into two groups, A or B, based on randomized permutation blocks with the block size of 4 (using tables related to random permutations). A total number of 72 patients were randomly assigned into groups A and B. Patients in the A group received 3 mg/kg of lidocaine 2% and patients in the B group received 3 mg/kg of lidocaine 2% plus DEX (1 µg/kg) (the injected amount in both groups was 30 ml). Based on the predefined numbers for mixtures, patients received analgesics and nerve block according to the standard method. A randomized list was prepared by a statistician. To perform supraclavicular blockade, the ultrasound apparatus (EdgeTM Mini-Dock, FUJIFILM Sonosite, WA 98021 USA) was applied to see the brachial plexus at the level between trunks and divisions by anesthesiologist who was not aware of the content of syringes and groupings. A linear array ultrasound transducer was used in the study. After infiltration of the site of needle insertion by local anesthetic, a sterile 45 mm, 22G needle (Sonoplex®, B. Braun, Germany), under ultrasound guidance, was inserted and after reaching the tip of the needle near the subclavian artery around the brachial plexus, the solution was injected and spread of drug was visualized. The continuous aspiration and injection was taken to avoid intravascular injection. The research assistant who was not aware of these aspects, completed the form including sensory and motor block and pain evaluation. The sensory block was evaluated with pin prick test in sensory dermatomes related to the sensory areas of radial, ulnar, median, and musculocutaneous nerves using 3-point scale. The motor sensory was evaluated using modified Bromage scale. To measure the onset of sensory and motor block, the tests were performed every 5 minutes and the sensory and motor block moment was recorded as the onset of the block. Then, sensory and motor block was recorded every 5 minutes until the first 30 minutes, then every 10 minutes until the next 30 minutes, and finally, every 15 minutes. The end of the motor block was determined with full movement of the limb and the end of sensory block was determined with pain in pin prick test. Also, the interval between the onset of sensory and motor block and the end of the block was recorded as duration of sensory and motor block. After the surgery and transferring the patient to the recovery room, the research questionnaire was completed. The assessment of the duration of sensory and motor block was continued in the recovery room. Score 4: Full muscle strength in relevant muscle groups. For evaluation of the severity of pain, a visual analog scale (VAS) was used for recording pain to circle the number between 0 and 10 (0: no pain and 10: the worst pain). The VAS was recorded before block, immediately after block, and every 5 minutes until the first 20 minutes and then, every 30 minutes during surgery. If the patient was experiencing pain with VAS higher than 3, 0.3 to 0.5 mg/kg pethidine was injected and if VAS was higher than 5 with unsuccessful block, he or she would be under general anesthesia and was excluded from the study. During surgery, heart rate, systolic and diastolic blood pressure, and oxygen saturation was recorded every 15 minutes. The first analgesic request time and total consumed analgesic during 24 hours were recorded. Patients were monitored for the occurrence of side effects during and after surgery for 24 hours. The quantitative variables were reported as mean, standard deviation, and qualitative variables as number (percentage). In this study, to investigate gender, Chi-square was used, for quantitative demographic variables, two-sample independent t-test was used, and for variables over time, two groups of repeated measures were used. The significance level of these tests was considered smaller than 0.05. Data analysis was performed using SPSS. A total of 72 patients who were candidates for forearm fracture surgery participated in this study in two equally assigned groups. Five patients in the A group were excluded from the study due to the VAS score higher than 5. Therefore, at the end of the study, 67 patients were monitored, 36 patients in the B (DEX) group and 31 patients in the A (control) group. In the rest of the patients, all blocks were successfully performed. None of patients required immediate intervention such as bradycardia and hypotension. Comparisons of demographic status between two groups are indicated in Table 1. No significant difference was observed between research groups (P-value < 0.05). a Group A, lidocaine; Group B, lidocaine + dexmedetomidine. b Values are mean ± SD. c P > 0.05 statistically insignificant, p < 0 .001 statistically significant. According to Table 2, in terms of block characteristics, there was a significant difference between the two groups. c P > 0.05 statistically insignificant, P < .001 statistically significant. Statistically significant difference was observed between two groups in the VAS pain scores following post-surgery (P < 0.001) (Figure 1). Figure 1. Comparison of VAS between two groups (A, lidocaine; B, lidocaine + DEX). Group A, lidocaine; Group B, lidocaine + dexmedetomidine. Patients hemodynamic parameters (heart rate, oxygen saturation, systolic and diastolic blood pressures) in each group were stable over time and the two groups showed no significant difference in the average variations of this parameters. Patients were controlled for adverse effects. Only two patients in the control group showed dizziness. The results of the study showed that adding 1 µg/kg of DEX to lidocaine significantly decreases the onset of sensory block compared with the control group, which support the findings of previous studies (14). Mirkheshti et al. (15), attributed that the difference in result in the onset of sensory block between the two groups may be due to the type of drug. 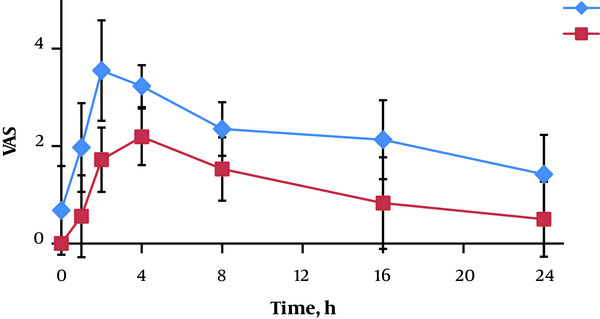 They demonstrated that lidocaine is an analgesic drug with moderate length of analgesic effect compared with other drugs that have long acting effects. The results of the study of Mirkheshti et al. (15), were in accordance with the finding of the Gandhi et al. (16), which was used as bupivacaine with DEX. Memis et al. (17), employed lidocaine for regional intravenous anesthesia. According to their results, adding DEX to lidocaine significantly decreased the onset of sensory and motor block compared with the control group. The results of the current study showed that adding of DEX in comparison with the control groups significantly decreased the onset of motor block. These findings were consistent with other investigations (5). However, our findings were in contrary with study of Kaygusuz et al. (18). The results of our study showed that DEX significantly increases sensory and motor block duration in local anesthesia. In previous studies, mixture with long-acting drugs compared with moderate-acting drugs showed longer duration; however, variations in dose, route of administration, and localization technique did not show any difference in results and all studies pointed to longer duration of sensory and motor block (19). Our results confirmed the findings of Das et al. (20). They performed a randomized and double-blind study on patient’s candidate for forearm surgery performed by supraclavicular BPB method. They used ropivacaine in control groups and DEX with ropivacaine in treatment groups. They showed that the onset of sensory and motor block in the DEX group was shorter than the control group, however, the difference was not significant. The duration of sensory and motor block was significantly longer than the control group (20). The first analgesic request time in our study in the DEX groups was significantly longer than the lidocaine groups. Esmaoglu et al. (21), also performed a randomized double blinded trial on patients who were candidates for forearm surgery and performed axillary BPB. In the control groups and treatment groups levopupivacaine and 100 µg DEX with levopupivacaine was received, respectively. Analgesic request time in DEX groups was significantly longer than the control groups (21). This study is consistent with the finding of Lee et al., Esmaoglu et al. and Das et al., which showed that the use of DEX as an adjuvant to local anesthesia decreases analgesic consumption dose (20-22). In the present study, patients’ heart rate, oxygen saturation, as well as systolic and diastolic blood pressure were controlled and evaluated. Patients were stable in both groups and no significant difference existed between research groups. In previous studies, blood pressure and heart rate in patients in DEX group were lower than the other groups. Hypotension and bradycardia are two common dose-dependent side effects of DEX. In the current study, the lower dose was used (23, 24). Zhang et al. (25), investigated the effects of adding DEX in two different doses to ropivacaine on the efficacy of axillary BPB in patients who were candidates of forearm surgery. The patients were divided into two groups: the control group (ropivacaine) and treatment groups, which received DEX with different dose of 50 µg and 100 µg with ropivacaine. Reduced onset of sensory and motor block and longer duration of sensory and motor block were related to the dose of DEX. Their study showed that by enhancement dose of DEX, the side effects were increased. Bradycardia was observed in all the patients that received 100 µg DEX, therefore, atropine was administrated to the 9 patient. Moreover, 6 patients and 3 patients showed hypertension and hypotension, respectively. However, in patients who received 50 µg DEX, only 8 patients exhibited bradycardia, 4 patients received atropine, and 2 patients showed hypotension. Whereas this drug is still not approved as an adjuvant for local anesthetic drugs by valid organizations such as FDA, it is recommended to conduct studies with larger samples to obtain more reliable data. Since, by enhancement, the dose of drug lead to improve the efficacy block; however, it increases side effects. According to the obtained results, it is suggested to use different doses of DEX with large samples to find the best dose with higher effectiveness and minimum side effects. The DEX in combination with lidocaine improved the BPB efficacy in terms of shortening the onset of sensory and motor block as well as prolonged the duration of sensory and motor block. Moreover, the first analgesic request time was prolonged and the consumed analgesic decreased, which consequently decreased the intensity of pain. Conflict of Interests: The author(s) declare that they have no competing interest. Funding/Support: The financial support was provided by pain research center and Ahvaz Jundishapur University of Medical Sciences. 1. Akhondzade R, Nesioonpour S, Gousheh M, Soltani F, Davarimoghadam M. The Effect of Magnesium Sulfate on Postoperative Pain in Upper Limb Surgeries by Supraclavicular Block Under Ultrasound Guidance. Anesth Pain Med. 2017;7(3). e14232. doi: 10.5812/aapm.14232. [PubMed: 28924560]. [PubMed Central: PMC5594567]. 2. Akhondzade R, Pipelzade MR, Gousheh MR, Sarrafan N, Mahmoodi K. Comparison of the analgesic effect of intra-articular and extra-articular injection of morphine and ketamine compound in arthrotomy lower limb surgery under spinal anesthesia. Pak J Med Sci. 2014;30(5):942-5. doi: 10.12669/pjms.305.4775. [PubMed: 25225503]. [PubMed Central: PMC4163208]. 3. Olapour AR, Mohtadi AR, Soltanzadeh M, Ghomeishi A, Akhondzadeh R, Jafari M. The Effect of Intravenous Magnesium Sulfate Versus Intravenous Sufentanil on the Duration of Analgesia and Postoperative Pain in Patients with Tibia Fracture. Anesth Pain Med. 2017;7(2). e44035. doi: 10.5812/aapm.44035. [PubMed: 28920052]. [PubMed Central: PMC5594416]. 4. Jafarian AA, Imani F, Salehi R, Najd Mazaher F, Moini F. Simple Arm Tourniquet as an Adjunct to Double-Cuff Tourniquet in Intravenous Regional Anesthesia. Anesth Pain Med. 2016;6(3). e29316. doi: 10.5812/aapm.29316. [PubMed: 27635387]. [PubMed Central: PMC5013696]. 5. Bansal P, Khatri ML, Garg KL. Supraclavicular Brachial Plexus Block: Effect of Using Dexmedetomidine as Adjuvant to Ropivacaine. A Randomized Double Blind Study. J Dent Med Sci. 2016;15(8):124-33. 6. Kirksey MA, Haskins SC, Cheng J, Liu SS. Local Anesthetic Peripheral Nerve Block Adjuvants for Prolongation of Analgesia: A Systematic Qualitative Review. PLoS One. 2015;10(9). e0137312. doi: 10.1371/journal.pone.0137312. [PubMed: 26355598]. [PubMed Central: PMC4565585]. 7. Taghipour Anvari Z, Afshar-Fereydouniyan N, Imani F, Sakhaei M, Alijani B, Mohseni M. Effect of clonidine premedication on blood loss in spine surgery. Anesth Pain Med. 2012;1(4):252-6. doi: 10.5812/aapm.2197. [PubMed: 24904810]. [PubMed Central: PMC4018704]. 8. Scott-Warren VL, Sebastian J. Dexmedetomidine: its use in intensive care medicine and anaesthesia. BJA Educ. 2016;16(7):242-6. doi: 10.1093/bjaed/mkv047. 9. Rahimzadeh P, Faiz SHR, Imani F, Derakhshan P, Amniati S. Comparative addition of dexmedetomidine and fentanyl to intrathecal bupivacaine in orthopedic procedure in lower limbs. BMC Anesthesiol. 2018;18(1):62. doi: 10.1186/s12871-018-0531-7. [PubMed: 29875020]. [PubMed Central: PMC5991430]. 10. Hu X, Li J, Zhou R, Wang Q, Xia F, Halaszynski T, et al. Dexmedetomidine Added to Local Anesthetic Mixture of Lidocaine and Ropivacaine Enhances Onset and Prolongs Duration of a Popliteal Approach to Sciatic Nerve Blockade. Clin Ther. 2017;39(1):89-97 e1. doi: 10.1016/j.clinthera.2016.11.011. [PubMed: 27955918]. 11. Eriksson LI. Miller's Anesthesia. illustrated ed. Elsevier Health Sciences; 2009. 3084 p.
12. Chou R, Gordon DB, de Leon-Casasola OA, Rosenberg JM, Bickler S, Brennan T, et al. Management of Postoperative Pain: A Clinical Practice Guideline From the American Pain Society, the American Society of Regional Anesthesia and Pain Medicine, and the American Society of Anesthesiologists' Committee on Regional Anesthesia, Executive Committee, and Administrative Council. J Pain. 2016;17(2):131-57. doi: 10.1016/j.jpain.2015.12.008. [PubMed: 26827847]. 13. Imani F. Postoperative pain management. Anesth Pain Med. 2011;1(1):6-7. doi: 10.5812/kowsar.22287523.1810. [PubMed: 25729647]. [PubMed Central: PMC4335751]. 14. Cham SC, Sangawar MA, Ramtani UL, Chavan BS, Cham C. Comparison of the Effects of Fentanyl and Dexmedetomidine in Supraclavicular Brachial Plexus Block Achieved with Ropivacaine. J Evolu Med Dent Sci. 2015;4(54):9427-36. doi: 10.14260/jemds/2015/1366. 15. Mirkheshti A, Saadatniaki A, Salimi A, Manafi Rasi A, Memary E, Yahyaei H. Effects of dexmedetomidine versus ketorolac as local anesthetic adjuvants on the onset and duration of infraclavicular brachial plexus block. Anesth Pain Med. 2014;4(3). e17620. doi: 10.5812/aapm.17620. [PubMed: 25237638]. [PubMed Central: PMC4165032]. 16. Gandhi R, Shah A, Patel I. Use of Dexmedetomidine Along with Bupivacaine for Brachial Plexus Block. Natl J Med Res. 2012;2(1):67-9. 17. Memis D, Turan A, Karamanlioglu B, Pamukcu Z, Kurt I. Adding dexmedetomidine to lidocaine for intravenous regional anesthesia. Anesth Analg. 2004;98(3):835-40. table of contents. [PubMed: 14980948]. 18. Kaygusuz K, Kol IO, Duger C, Gursoy S, Ozturk H, Kayacan U, et al. Effects of adding dexmedetomidine to levobupivacaine in axillary brachial plexus block. Curr Ther Res Clin Exp. 2012;73(3):103-11. doi: 10.1016/j.curtheres.2012.03.001. [PubMed: 24648597]. [PubMed Central: PMC3954022]. 19. Agarwal S, Aggarwal R, Gupta P. Dexmedetomidine prolongs the effect of bupivacaine in supraclavicular brachial plexus block. J Anaesthesiol Clin Pharmacol. 2014;30(1):36-40. doi: 10.4103/0970-9185.125701. [PubMed: 24574591]. [PubMed Central: PMC3927290]. 20. Das A, Majumdar S, Halder S, Chattopadhyay S, Pal S, Kundu R, et al. Effect of dexmedetomidine as adjuvant in ropivacaine-induced supraclavicular brachial plexus block: A prospective, double-blinded and randomized controlled study. Saudi J Anaesth. 2014;8(Suppl 1):S72-7. doi: 10.4103/1658-354X.144082. [PubMed: 25538527]. [PubMed Central: PMC4268534]. 21. Esmaoglu A, Yegenoglu F, Akin A, Turk CY. Dexmedetomidine added to levobupivacaine prolongs axillary brachial plexus block. Anesth Analg. 2010;111(6):1548-51. doi: 10.1213/ANE.0b013e3181fa3095. [PubMed: 20889939]. 22. Lee MJ, Koo DJ, Choi YS, Lee KC, Kim HY. Dexamethasone or Dexmedetomidine as Local Anesthetic Adjuvants for Ultrasound-guided Axillary Brachial Plexus Blocks with Nerve Stimulation. Korean J Pain. 2016;29(1):29-33. doi: 10.3344/kjp.2016.29.1.29. [PubMed: 26839668]. [PubMed Central: PMC4731548]. 23. Ping Y, Ye Q, Wang W, Ye P, You Z. Dexmedetomidine as an Adjuvant to Local Anesthetics in Brachial Plexus Blocks. Medicine. 2017;96(4). e5846. doi: 10.1097/md.0000000000005846. 24. Hussain N, Grzywacz VP, Ferreri CA, Atrey A, Banfield L, Shaparin N, et al. Investigating the Efficacy of Dexmedetomidine as an Adjuvant to Local Anesthesia in Brachial Plexus Block: A Systematic Review and Meta-Analysis of 18 Randomized Controlled Trials. Reg Anesth Pain Med. 2017;42(2):184-96. doi: 10.1097/AAP.0000000000000564. [PubMed: 28178091]. 25. Zhang Y, Wang CS, Shi JH, Sun B, Liu SJ, Li P, et al. Perineural administration of dexmedetomidine in combination with ropivacaine prolongs axillary brachial plexus block. Int J Clin Exp Med. 2014;7(3):680-5. [PubMed: 24753763]. [PubMed Central: PMC3992408].